Herbert Percival Ostler, known as Bert, was born in Yeovil in 1899. He was the youngest of the six children of tailor and coat maker Frank Ostler (1867-1920) and Anne Louisa née Marsh (1871-1949), known as Annie; Reginald (b1890), Elsie (b1892), Rupert Stanley (b1894), Ivy Gertrude (b1895), Daisy Victoria (b1897) and Bert. In the 1901 census Frank and Annie were listed living in Orchard Street, on the corner with Beer Street. Frank gave his occupation as a tailor and coat maker. In the 1911 census the family were listed at 44 Beer Street. Frank gave his occupation as a tailor (maker) while 12-year old Bert was at school. When he left school Bert worked as a clerk at the Western Gazette in the publishing department. Bert enlisted at Yeovil in April 1917, joining the 15th (Service) Battalion (2nd Portsmouth), Hampshire Regiment. His Service Number was 28751. The battalion had been fighting in France since May 1916, but Bert was not to join his battalion in France until March 1917 - after he had completed his basic training. We can be almost sure that Henry took part in the Battle of Messines with the 15th Battalion. On 27 September 1917 the 15th (Service) Battalion (2nd Portsmouth) were amalgamated with the 1/1st Hampshire Yeomanry who, by this time, were dismounted. The battalion was then engaged in another battle - the Battle of Pilkem Ridge. This battle was the opening attack of the Third Battle of Ypres, which later became known as Passchendaele. The battle began at 3:50am on 31 July 1917, when 2,000 Allied guns opened fire on German lines and 14 British and two French divisions attacked along 15 miles of the Front. On the afternoon of 31 July, rain began to fall on the battlefield. Over the following days the shell-damaged ground became a quagmire, severely hampering the advancing troops, and making the movement of artillery, casualties and supplies very difficult. After three days, the Allied advance was half of what had been planned. The British Army had suffered some 27,000 casualties wounded, killed and missing. Most of the dead have no known grave. The 15th Battalion next took part in the Battle of the Menin Road Ridge (20 to 25 September 1917). This battle marked a change in British tactics during the Third Battle of Ypres. The first part of the battle had been commanded by General Sir Hubert Gough (Fifth Army). That choice had forced a delay of six weeks while the Fifth Army moved into place, replacing General Herbert Plumer’s Second Army. Gough had performed no better than earlier commanders on the Western Front. The Germans had perfected defence in depth. Their front lines were lightly defended. Behind the front line scattered German strong points disrupted any Allied advance. Once the British or French attackers were disorganised, the Germans would launch a counterattack with specially trained divisions kept out of range of Allied artillery. A series of Allied attacks on the Western Front had penetrated the German front line but failed to get past the second. In the aftermath of the earlier failures at Ypres, Plumer suggested an alternative plan – his “bite and hold” strategy. This was designed to use the German plan against them. The British would pick a small part of the front line, hit it with a heavy bombardment and then attack in strength. The advancing troops would stop once they had penetrated 1,500 yards into the German lines. At this point they would have overrun the German front line and perhaps some of the strong points behind the lines. The attacking troops would then stop and dig in. When the German counterattack was launched, instead of finding a mass of exhausted and disorganised men at the limit of the Allied advance, they would find a well organised defensive line. Plumer was given permission to try his new plan, and three weeks to prepare. His men received detailed training. The battle began with a creeping barrage 1,000 yards deep, which protected the attacking infantry. The British attacked with four divisions – from north to south the 2nd Australian, 1st Australian, 23rd and 41st Divisions. The attack was a great success. The majority of Plumer’s objectives were captured on the first day of the attack, only the 41st Division needed to follow up on the following day. German counterattacks were repulsed the first and second days of the attack. On 12 November 1917 the battalion moved to Italy, arriving at Mantua, to strengthen the Italian resistance. In March 1918 they returned to France and once again engaged in various actions on the Western Front. They were immediately in action in the Battle of St Quentin (21-23 March 1918) and the First Battle of Bapaume (24-25 March 1918), both were phases of the First Battles of the Somme 1918. The Battle of St Quentin began the German's Spring Offensive on 21 March 1918. It was launched from the Hindenburg Line, in the vicinity of Saint-Quentin, France. Its goal was to break through the Allied lines and advance in a north-westerly direction to seize the Channel ports, which supplied the British Expeditionary Force (BEF) and to drive the BEF into the sea. Two days later General Ludendorff, the Chief of the German General Staff, changed his plan and pushed for an offensive due west, along the whole of the British front north of the River Somme. This was designed to separate the French and British Armies and crush the British forces by pushing them into the sea. The offensive ended at Villers-Bretonneux, to the east of the Allied communications centre at Amiens, where the Allies managed to halt the German advance; the German Armies had suffered many casualties and were unable to maintain supplies to the advancing troops. Much of the ground fought over was the wilderness left by the Battle of the Somme in 1916. The action was therefore officially named by the British Battles Nomenclature Committee as The First Battles of the Somme, 1918. For much of the rest of 1918 the 15th Battalion were engaged in no major battles, but settled into the grueling daily life of trench warfare. On 4 September (several sources say 6 September) 1918, Bert Ostler was killed in action. He was just 19 years old. 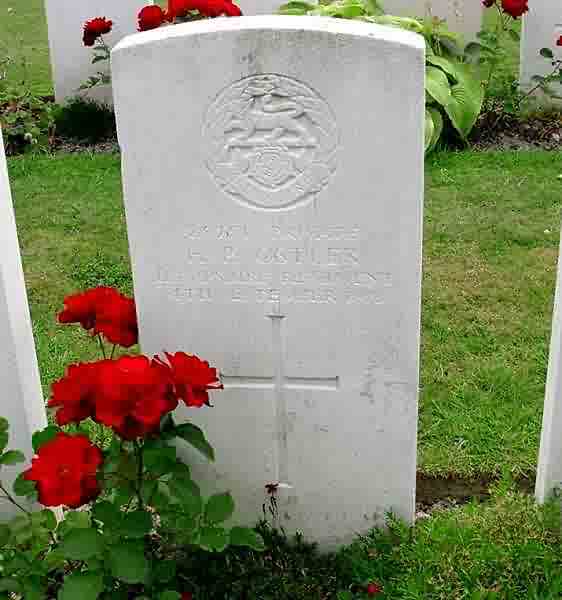 The Western Gazette, in its edition of 27 September 1918, recorded "Information has been received that Private HP Ostler, - Hants Regiment, and formerly a clerk employed in the publishing department of the Western Gazette has made the supreme sacrifice on the battlefields of France. The following is an extract for a letter received from a comrade by his parents:- “It is with deepest sorrow that I have to inform you of your lad’s sad death, which occurred on the morning of September 6th. I found him lying on the battlefield where he had just died in action, fighting bravely for home and country. I trust you will not grieve too much, for he knew no suffering.” Private Bert Ostler joined up in April 1917, and had been in France six months. He was just 19 years of age, and when at home was a member of Yeovil Boys’ Brigade. His many friends have heard the news with deep regret. The parents and family (3 Harfield Terrace, South Street) desire to thank the numerous friends who have kindly expressed to them their sincere sympathy in their bereavement. Mr and Mrs Ostler have two other older sons serving in the Army - one in Palestine in the Royal Engineers, and another in India with the Somerset Light Infantry." Bert was interred in Voormezeele Enclosure No. 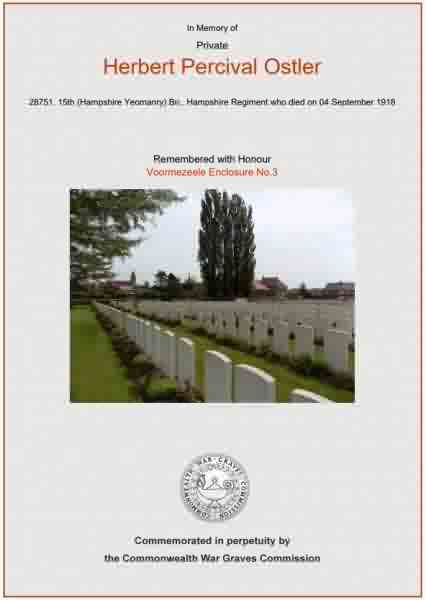 3, West Vlaanderen, Belgium - Grave XVI.J.6., and his name is inscribed on the War Memorial in the Borough. The Commonwealth War Graves Commission certificate in memory of Bert Ostler. Bert Ostler's CWGC headstone in Voormezeele Enclosure No 3, West Vlaanderen, Belgium.